Bergen's oldest surviving building, the beautiful stone Church of St Mary's, dates from the beginning of the 12th century. The interior is decorated with old frescoes and a splendid Baroque pulpit donated by the Hanseatic merchants in 1676. The twin towers of the church are distinctive among the low red-tiled roofs of the old quarter. St Mary's is constructed mainly of soapstone and the architectural style is predominantly Romanesque. 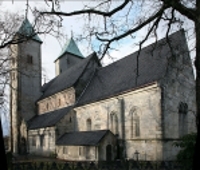 The Church of St Mary's is the only one surviving of 12 churches and three monasteries built around the time of Bergen's foundation. Its survival is mainly due to the fact that it was the chosen place of worship for the wealthy German merchants of Bergen, whose patronage ensured it never fell into ruin. Like many buildings in Bergen, St Mary's has been damaged by several fires through the centuries and has therefore been repaired and renovated. But even considering these slight alterations, the structure remains remarkably intact and has ultimately changed very little through the ages. The church is an active place of worship and those wanting to attend services will find them listed on the website below. Sightseeing visitors are also welcome.